The 5BH Thumbsnap Holster from Bianchi is classically styled holster crafted in the tradition of the wild west. Featuring a beautiful leather construction made from only premium materials, the 5BH is a dream come true for any revolver owner. Its hand boned body delivers a precise fit that matches the contours and grooves of the pistol. All seams are reinforced with double stitching to ensure the holster stands up to the roughest conditions possible. To provide added security, an integral thumb snap wraps around the rear of carrier for added protection and enhanced pistol retention. Designed for tactical application, the holster rides high and close to body for all day comfort that is easily concealed. Fits my Ruger GP100 perfectly and is made from great leather. Will last a lifetime. Fits like a glove, almost. Fits perfectly. Exactly what I wanted. Good quality. 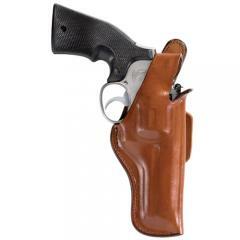 Excellent quality and well made holster. Purchase was effortless and delivery on time.